#MoviesMusicPlaysFilmFestivalsConcerts: News: Theatrical release of acclaimed documentary "The Mind of Mark Defriest" announced! News: Theatrical release of acclaimed documentary "The Mind of Mark Defriest" announced! With the good news of Defreist's parole being granted, Gabriel added a new ending to the film! This is one amazing news! 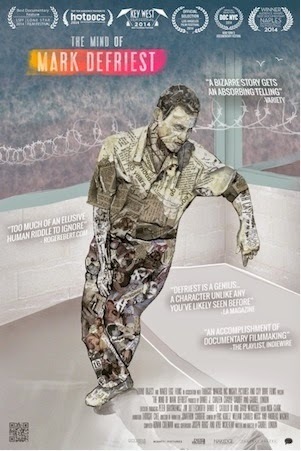 I saw this film at last year's Los Angeles Film Festival and I was really taken aghast by the injustice committed against Mark Defriest and featured a review of the film in this blog. (You can read it here http://raymonddeasislo.blogspot.com/2014/06/los-angeles-film-festival-diary-day-6.html.) I also included this doc among my favorites movies of 2014. And this is not even the great news yet. The greater news is that Mar Defriest was granted parole just two days ago! It is effective on March 10th! His original parole date set at 2085 will now be potentially cut by 70 years from his original release date --- this is one news that Mark has waited for three decades. The film and the audience reactions have had a great impact in bringing awareness of the unjust incarceration of the film’s subject, Mark Defriest, which has aided this amazing possible sentence reduction. This is a testament to the power of film. Award-winning filmmaker Gabriel London has been following Mark's story for 12 years and the possibility of Mark Defriest's freedom during his lifetime was, until a few months ago, incomprehensible. This documentary captures the bizarre, infuriating story of a carefree19-year-old Mark Defriest who ended up in solitary confinement for most of his adult life in a Florida prison. His crimes? Taking the tools his father, who was recently deceased, had willed to him before the will was probated. The only home he has ever known is a prison cell, despite repeated escape attempts and doubts that he ever belonged in prison. Originally found ‘incompetent to be sentenced’ by five of six psychiatrists, he, like many mentally ill prisoners, has spent an incredible amount of time in solitary confinement – 27 of the last 34 years. After years of disciplinary write-ups – common with the mentally ill – Defriest’s parole date stood at 2085. After the film was released, audiences responded with anger and passion to the perceived injustice in Defriest’s case. Filmmaker Gabriel London traveled to Tallahassee to share the film to the Florida Commission on Offender Review. Dubbed as “Florida’s Houdini” and “unluckiest prisoner” by the press, Defriest recently was granted parole. His legendary escapes and stranger-than-fiction entry to the injustice system now serve as an catalyst for prison reform. "The Mind of Mark Defriest" has won awards and critics’ praises ever since its film festival debut. Filmmaker Gabriel London successfully captures the haunting story with exclusive interviews, access to the subject, and visually-stunning animations. You have to watch this movie!! !